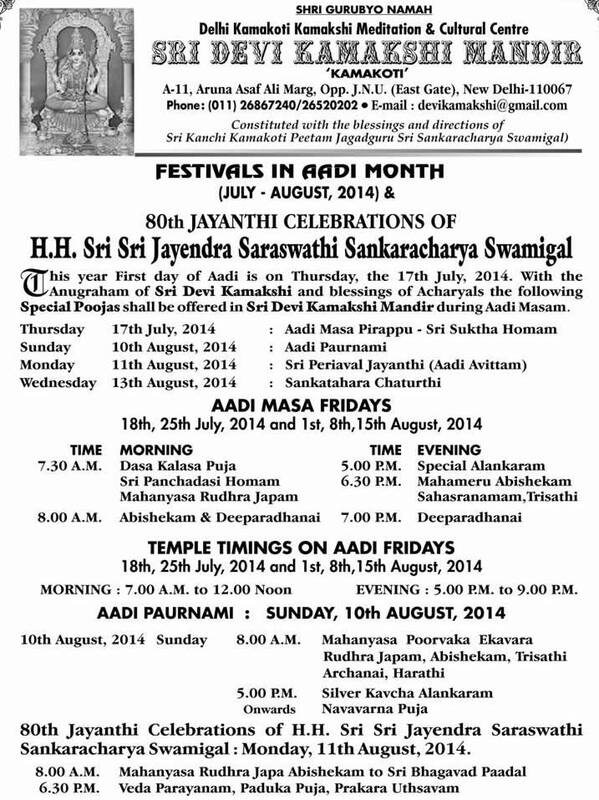 With the divine blessings of Their Holinesses Pujyasri Jayendra Saraswathi Sankaracharya Swamiji and Sri Sankara Vijayendra Saraswathi Sankaracharya Swamiji, various festivals will be celebrated at Sri Devi Kamakshi Mandir, New Delhi in the Adi month(July-August 2014) commencing 18 July 2014. 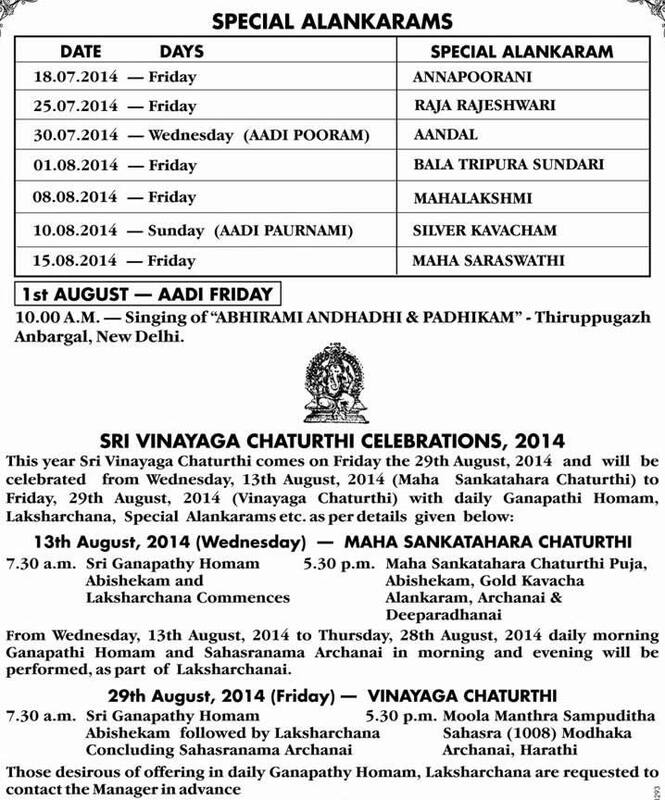 Special pujas will be performed every Friday of the Adi Month. The 80th Jayanthi of His Holiness Pujyasri Jayendra Saraswathi Sankaracharya Swamiji will be celebrated on 11 August 2014 at the temple. 10th Aug. 2014 (SUNDAY) - AADI PAURNAMI - Homam at 8.00 A.M., Mahanyasa Rudhra Japa Abishekam, Pujas in morning and Silver Kavacha Alankaram, Navavarna Puja in evening. 6.30 pm - Veda Parayanam, Paduka Puja, Prakara Uthsavam in evening. 29th August, 2014 - VINAYAGA CHATURTHI - Ganpathy Homam, Abishekam followed by Laksharchana Concluding Sahasranama Archanai in the morning Moola Manthra Sampuditha Sahasra (1008) Modhaka Archanai in the evening.